Yesterday was a doozy. I hope to be back in force next week, but for now, I’ll just tell you briefly what I put together last night. I spotted some whole Spanish mackerel at Wild Edibles a few days ago, and hoped they would still have some available so I could make this, but when I stopped off on my way home last night there was no mackerel left. They did have some gorgeous fresh wild sardines, though, so I grabbed a pound of those instead. I halved a pound of fingerlings lengthwise and tossed them with olive oil, kosher salt, a copious amount of fresh thyme and a tablespoon or so of smoked Spanish paprika, then roasted them on a sheet pan in a 300 degree oven for 30 minutes. I pulled out the potatoes and placed a layer of sardines on top, seasoning them with salt and drizzling a bit of olive oil on top, then placed them back in the oven (now at 400) for another 20 minutes, gently turning the sardines midway through. When the potatoes and sardines were done, I pulled them out of the oven and plated them on a bed of baby arugula, drizzling a good amount of sherry vinegar over the top. 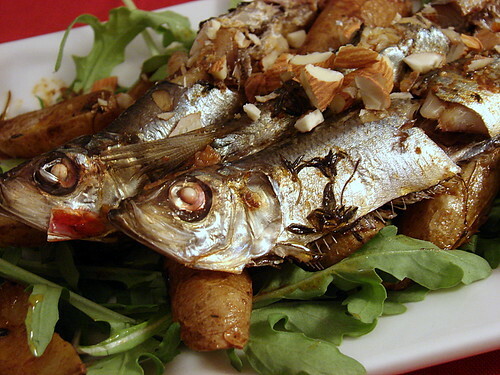 I finished them with a sprinkling of coarsely chopped raw almonds for a bit of crunch, and as a nod to the grilled sardine with romesco I had at La Laiterie in Providence our last trip up (which is where we had that waffle with foie, for those of you who asked). 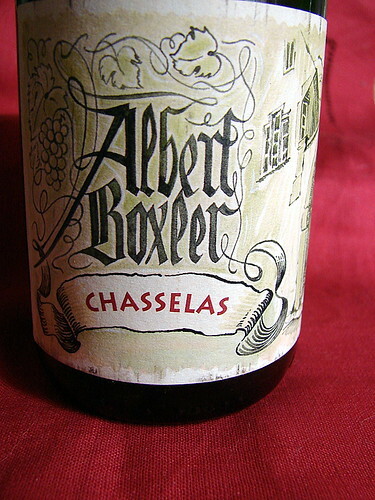 This was a relatively quick and very easy dinner, the flavors harmonizing beautifully, and the whole meal was elevated by Mike’s wine selection, this 2005 Albert Boxler Chasselas. The light, bright flavor cut through the richness of the sardines and paired really well with the other flavors in the dish. do you eat the heads and all? I love sardines and was just trolling around for recipes and came across yours. It sounds great. Your photo of the food is really striking, too. You’re obviously a good photographer. What kind of camera are using? Thanks, Moshe! I’m still quite a novice as far as photos go, but I’m learning and hopefully improving. 🙂 I use a Sony DSC-H2, and I have been very happy with it. Thinking about it later, I realized that the lighting approach you took had at least as much or more to do with the quality of the shot as your camera. What’s your set-up like? Do you have a standing arrangement of lights and/or reflectors ready to capture your latest culinary improvisation? There can’t be much time available for photo setups between cooking and eating!